Nourish your feline friend with the complete and balanced nutrition of Precise Holistic Complete Salmon Meal & Spring Yellow Pea Grain-Free Dry Cat Food. Featuring real salmon meal as the first ingredient for a high-quality protein formula that’s great for all life stages—from kittens to adults. 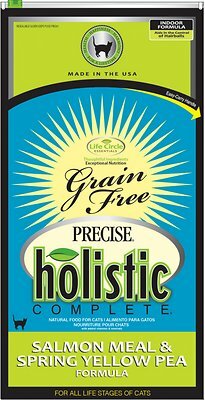 This grain-free kibble also includes spring yellow pea flour for those cats that need a low-glycemic diet that won’t spike their blood sugar levels. With added vitamins and chelated minerals, so your cat can better absorb them. Contains prebiotics and probiotics to help support your pal’s digestion, plus omega fatty acids from chicken fat, sunflower oil and fish oil to promote healthy skin and a shiny coat. Filled with natural antioxidants from fruits and vegetables for his over health and well-being. Best of all—it’s naturally preserved, and this indoor formula helps control of hairballs. 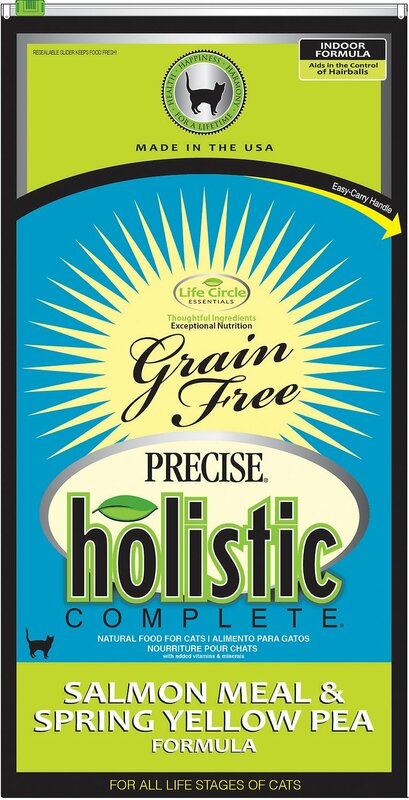 Great for all life stages, this grain-free formula features salmon meal and spring yellow pea flour as the first ingredients, plus chamomile, dandelion and peppermint for added natural digestive aids. Prebiotics and probiotics added for healthy digestion and balanced omega fatty acids to promote healthy skin and a shiny coat, plus taurine to help support your cat’s healthy vision and strong heart function. Yucca Schidilgera extract is added to reduce stool odor, plus chicken fat, sunflower oil and fish oil for healthy skin and a shiny coat. Contains natural antioxidants from carrots, blueberries, cranberries and kelp to provide important vitamins and minerals that help promote overall health and vitality. Naturally preserved with vitamins C and E, plus the minerals added are chelated, which means that your pet can absorb them better, and it’s made in the USA. Salmon Meal, Spring Yellow Pea Flour, Spring Yellow Pea Starch, Chicken Meal, Chicken Fat (Preserved with Mixed Tocopherols and Ascorbyl Palmitate), Tomato Pomace, Dried Egg Product, Citrus Fiber, Natural Flavor, Menhaden Fish Oil, Sunflower Oil, Dried Kelp, Dried Carrots, Dried Cranberries, Dried Blueberries, Chamomile, Dandelion, Peppermint, Rosemary, Turmeric, Dried Bacillus Coagulans Fermentation Product, Chicory Root (a Source of Inulin), Potassium Chloride, Salt, Calcium Carbonate, Parsley Flakes, Yucca Schidigera Extract, Calcium Ascorbate (Source of Vitamin C), Phosphoric Acid, Taurine, Vitamin A Supplement, Vitamin D3 Supplement, Vitamin E Supplement, Vitamin B12 Supplement, Iron Amino Acid Chelate, Cobalt Amino Acid Chelate, Riboflavin Supplement, L-Lysine, Dl-Methionine, Niacin, Calcium Pantothenate, Manganese Amino Acid Chelate, Zinc Amino Acid Chelate, Choline Chloride, Folic Acid, Biotin, Thiamine Mononitrate (B1), Pyridoxine Hydrochloride (B6), Sodium Selenite, Calcium Iodate, Copper Amino Acid Chelate. In addition to food, always make sure fresh water is available. Vitamins, minerals, and other supplements are not necessary. When switching foods, adjustment should be gradual. If a loose stool persists beyond 3 days, consult with Precise Pet Products or your local veterinarian. Feeding amounts may vary by breed, activity level, temperament, and climate. Adult Cats: Divide the recommended serving amount into 2 meals per day, using the feeding chart as a guide. Kittens: Start kittens on Grain Free Salmon & Spring Yellow Pea Formula as early as they begin to nibble on solid foods, usually 3 - 5 weeks. While they continue nursing, keep moistened food available at all times until your kittens are fully weaned at 6 - 8 weeks. 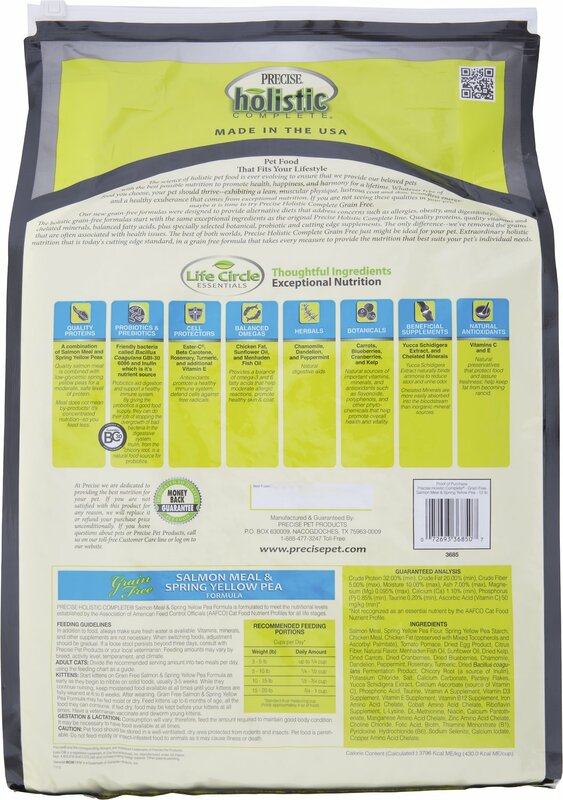 After weaning, Grain Free Salmon & Spring Yellow Pea Formula may be fed moist or dry. Feed kittens up to 6 months of age, all the food they can consume. If fed dry, food may be kept before your kittens at all times. Have a veterinarian vaccinate and deworm young kittens. My cat doesn’t want to eat his food anymore? Did Precise (Salmon and Yellow Peas) changed the recipe? He spent over a year eating the same food w/out problem and now he doesn’t want it anymore. Did Precise change the recipe? I need a refund and recommendations on what other brand to use instead. My cat has been eating Precise for years, sadly, he won't anymore. He sniffs it and walks away just like other reviewers mentioned. What do I do now????? We have been buying this product for many years. All of sudden the cats won`t eat it, they sniff it and walk away. WHAT HAPPENED? I only got this one from Chewy because the regular grain free Chicken has been out of stock for a month. Don't know whats happening with the Precise Company right now. My cats eat it at least. WHen did they change the size of the dry morsel? It use to be bigger! They are medium size nibbles for my cats which is better for their teeth, and they love this food! It's a healthy product! It contains great ingredients to keep my pets healthy. I have one cat that eats it. He will eat pretty much anything. My other cat is not too thrilled. They both like the Pork with Yellow Peas. My fantasy would be to have NO dry food whatsoever. However the peas are excellent fiber. I have tried pumpkin. I have tried adding drug store fiber to their canned food but it just does not work as well. I am going back to the Pork but it doesn't mean the Salmon is bad. Five out of five loved it! I tried this on a whim and I will be reordering! 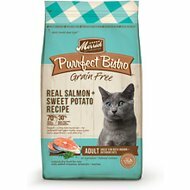 All of my cats could not stop eating this food and it has great ingredients. Lucky find Happy cats!